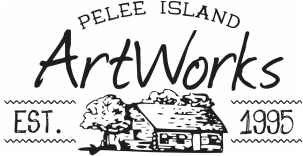 Pelee Island Community Arts is a charitable non profit organization run by a volunteer board. This dedicated group spends countless hours nurturing arts and culture in the unique community of Pelee Island. To establish and maintain a Community Arts Centre on Pelee Island for the benefit of the community. To support the creation and presentation of the arts on Pelee Island by professional artists. To promote the growth, development and presentation of local arts and crafts through public education and opportunities for public participation in arts events. To support the social, economic, cultural and environmental development of Pelee Island through arts, cultural and community partnerships. ​Art Works Uncorked - Lobsterfest – Is a day long awareness and fundraising event. An opportunity to meet the artists and purchase one of a kind items while enjoying the amenities of the Pelee Island Winery. Finishing the day with a celebratory dinner that raises money to support projects of Pelee Island Community Arts. ​The Island Unplugged Music Festival is a joint project of Pelee Island Community Arts and The Pelee Island Heritage Centre. The annual music festival provides a family centred event featuring music from local, regional and nationally know artists/performers, food and artisan venders.